Make e-zines short, but not too short - Wylie Communications, Inc.
From the Can’t-Win-For-Losing Department: Although subscribers’ No. 1 piece of advice to email newsletter creators is to keep e-zines short, those same subscribers generally get frustrated when newsletters are too brief. This according to the Nielsen Norman Group’s 6 rounds of email newsletter usability studies conducted over 16 years. Don’t omit details. Don’t make recipients search for the price, for instance. Don’t make them click. Don’t use email newsletters to drive clicks. Use them to deliver value. And put that value right there, in the newsletter. Don’t cut off mid Subscribers see that as a way to force clicks. Make links clear. If recipients must click to read, be very clear about what they’ll get if they do click. Deliver enough details to draw subscribers to your website. So avoid Click here, Read more in email newsletters. Your readers spend an average of just 11.1 seconds on each email they review. That’s enough time to read about 37 words — not your whole message. 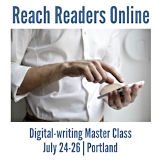 To find out, please join me at Reach Readers Online — our three-day digital-writing workshop on July 24-26 in Portland. 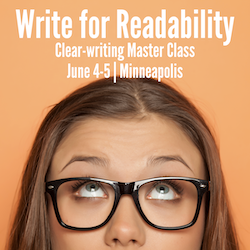 You’ll learn to write emails, blog posts and webpages that overcome the obstacles of reading on the screen. Save $100 when you book by April 24.